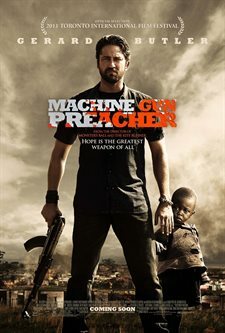 Download Machine Gun Preacher in Digital HD from the iTunes store. Machine Gun Preacher images are © Relativity Media. All Rights Reserved. Director Marc Forster who filmed Quantum of Solace and Monster's Ball brings Machine Gun Preacher to the screen and drives home a winner. His production of the true story of the merciless killings in East Africa and one man's untiring commitment to helping children in the path of civil war provides a chill that's hard to forget. The story involves Sam Childers (Gerard Butler), a badass biker with a penchant for drugs. His life is out of control and leads him to prison. Upon release he goes back to his way of life, but takes notice that his wife Lynn (Michelle Monaghan) has found a religious path over the past years since he's been gone. Shirking the notion of church, Sam continues his violent ways. After being knifed on one of his drug flings, he starts to think about his past and what it has done him and his children. He decides to attend his wife's church and there he finds the good he has been missing in his life. When a visiting preacher talks about the strife in Africa, Sam takes notice and builds a church of his own. Not content with this calling he goes to Africa where he sees the violence being done to the children, taking him on a path to save them in the face of the brutal Lord's Resistance Army (LRA). It's a strange role for Butler, but he handles it very well depicting the druggie turned savior. Forster makes Butler this worthless wreck of a human wallowing in the mire of drugs and violence. Giving an outstanding performance, Butler brings out the nastiness in Childers and his defiance, even to his family. Slowly Forster starts to shed Butler's skin as Childers moves out of the ugly cocoon into a place of moral acceptability. But it doesn't end there because Childers is so obsessed with meeting his goal that anyone around him feels the pain, even if it's his best friend Donnie (superbly played by Michael Shannon) and daughter Page (Madeline Carroll). When things start to fall into place, however, then finally Butler as Childers can be a man to be valued. Machine Gun Preacher is all about the fight within Childers because that's where the real story lies. He's a man that cannot accept anything that's not his way, whether beating a drug dealer nearly to death while stealing his drugs or showing no mercy for fallen LRA members who are killing under orders. Caught up in an impossible war with very few options, he fights even as I write this article against the slaughter of hundreds of kids. It's a bitter film that has a two-sided coin where the audience must decide whether it's righteous or a desire of forgiveness for a life of crime. The film shows the inhumanity of man in this seemingly outrageous civil war taking place even today in East Africa. Foster doesn't spare any visual proof depicting charred bodies, children being sliced and families destroyed. In one unforgettable scene, Childers has to decide which twenty of the forty children who are in harm's way to take to safety in his pick-up truck. When he returns to get the other twenty…. Well let me just say it's a jarring illustration of a shameful society. Machine Gun Preacher is rated R for disturbing content including disturbing images, language, some drug use and a scene of sexuality. The film gets so intense at one point that I winced and turned away. FINAL ANALYSIS: A disturbing film with a cause.